Happy New Year! Thanks for stopping by to see what I'm digging in this week's Disney edition (yes, I just got back from four magical days)! Don't forget to pop over to the other gals' sites to see what they're loving, too: Misha, Kendra, Mary Beth, and Amanda. Back in August (when the Bears had potential), I pre-ordered these Almost Right Sweaters to give my family as Christmas gifts. We had booked a trip to Walt Disney World for New Year's and I had visions of the whole gang walking about the parks in festive matching attire. They arrived in late September and I was extremely excited. Unfortunately, week by week, the Bears turned uglier than the sweaters. In November, I noticed that the box they had been shipped in was a recycled Aaron Rodgers doll carton. Bad karma! Anyways, I apologetically presented them to my family at Christmas. Thankfully, they were still thrilled with their gifts. My vision came to life on Wednesday when the Orlando air chilled to sweater weather. We spent NYE at Disney Studios sporting our loud tribute to our hometown team. It's amazing how many people shouted out "Da Bears!" or came up to chat about the sweaters. Turns out, they were an awesome investment....Cutler, not so much. 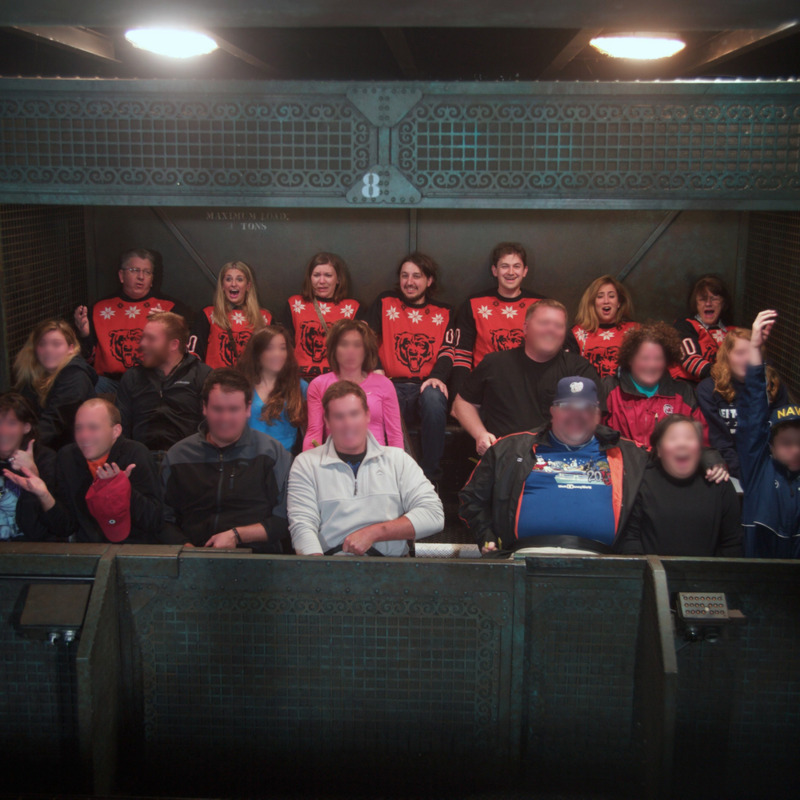 Owning the back row on Tower of Terror. TWO: Toy Story Midway Mania! Toy Story Midway Mania! is a relatively new ride at Hollywood Studios. Like Buzz Lightyear's Space Ranger Spin, this is a game-style ride. You wear 3-D glasses and play five carnival digital games. The wait time is still really long, though, so I recommend booking a Fastpass as early as possible. Dole Pineapple Whip is my favorite snack in Disney. It's a super fresh vegan option that is full of pineapple flavor. I've had it at Disneyland, WDW, and at the Dole Pineapple Plantation in Hawaii. It never disappoints! I even bought a Pineapple Whip air freshener for the car. Hope you had an awesome holiday! Welcome, 2015! See ya next week. Happy day after Christmas! Hope y'all had a wonderful holiday! Thanks for stopping by to see what I'm digging this week. Don't forget to pop over to the other gals' sites to see what they're loving, too: Misha, Kendra, Mary Beth, and Amanda. For Christmas, my brother and sister-in-law tapped into my love of granola bars. At YouBars, you can custom order delicious, preservative-free snacks made with organic ingredients. Brandon and Jen created a recipe that included my favorites like ginger, cocoa, dried cherries, nuts, apples, and cinnamon. They named the bar #snackforlaura. (The three of us were talking in hashtags way before Jimmy and JT. #oghashtaggers.) What an awesome, healthy, and personal present! Dune Jewelry is a clever company that custom makes accessories using sand from your favorite beach. They have a large bank with a long list of destinations to choose from. In the past, my parents bought me a necklace with sand from my home beach, Kiawah, and earrings from my old stomping ground, Waikiki. Yesterday, I was presented with a Walden Pond necklace. It will forever remind me of my wonderful New England trip. In addition to earrings and necklaces, you can design key chains, rings, or cuff links. Again, it's an amazingly personal gift! My family plays A LOT of board games. After a while, the usuals can get a little boring. So, my parents bought four new selections for Christmas. One of them was Ticket to Ride. Aside from being a killer Beatles song, Ticket to Ride is also a super fun strategy game. 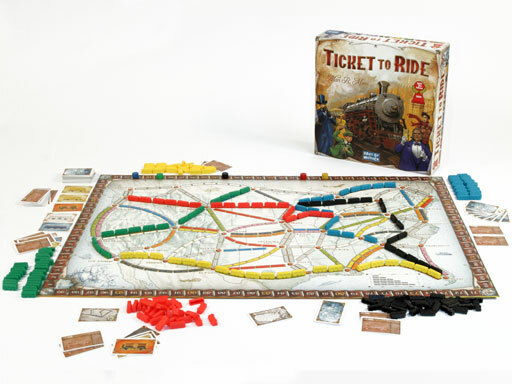 The object of the game is to acquire the most points by building train routes. Check it out if you get a chance! Kruškovac is a Croatian pear liqueur traditionally consumed by my family during holidays and reunions. Growing up, we spent Christmas evening at my Uncle Matt and Aunt Norma's alongside countless uncles, aunts, cousins, and friends. Every so often, some of the adults would gather 'round the bar and Uncle Matt would pour each of them a Kruškovac shot. Raising their glasses and shouting out Christmas salutations, the whole group would drink up. In a few days, I'll be seeing my brothers and sisters-in-law...we have two bottles ready. :) Zivio! So, yeah, we drank some the other night. Uncle Matt (left) and my Grandpa (right) on Christmas many moons ago. Kruškovac highlighted in yellow. I hope you had a wonderful Christmas and I wish you a Happy New Year! See ya next Friday in 2015! Before my trip to New England, I was in desperate need of a new camera bag. Mine was too small to fit my equipment and it was falling apart. After a bit of research, I discovered Kelly Moore bags and fell in love. These awesome accessories are very roomy and feature protective padded "baskets" with removable dividers. They allow the photographer to adjust the interior to his/her specifications. Kelly Moore offers a variety of fashionable styles for men and women. I love that mine looks like a purse. Now I can go into stores without it being obvious that I'm carrying expensive equipment. Me with my Kelly Moore B-Hobo at Ralph Waldo Emerson's house. 'Tis the season for cold weather beers! Shiner Holiday Cheer is one of my favorites. A lot of breweries end up releasing stouts, ales, and porters crafted with spices, chocolate, and vanilla. Don't get me wrong, I happily enjoy the full-bodied darks. However, it's always refreshing to find a lighter blend and Holiday Cheer is just that. It's made with peaches and pecans giving it a fruity, yet nutty taste. It's not hoppy, nor wheaty...just a nicely flavored beer. And, bonus, the packaging is awesome! I love the colors, fonts, and retro stars sprinkled across the labels. Cheers! The Royal Family released three new portraits of Prince George and they are absolutely adorable! 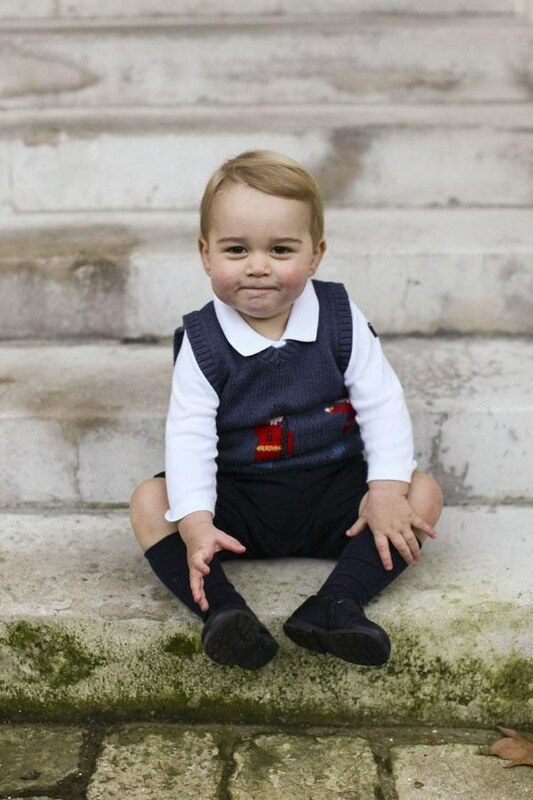 If I ever have a son, I want him to look like George. Just another reason why Prince Harry and I would be perfect together. Speaking of cute kids from the UK, this video of two mini-Brits opening holiday presents is darling! I could listen to them say 'banana' and 'onion' all day long. That's another thing, I'd like for my children to have British accents. Are you listening, Harry? Cheerio, ol' chap! Have a splendid weekend! I'm one of those rare breeds that actually looks forward to wrapping Christmas gifts. I delight in choosing paper, ribbons, and gift tags. When November rolls around, I start scoping out my favorite gift wrap shops to see their holiday collections. By Thanksgiving, I have my orders placed. This year, I chose wrap from Rifle Paper Co. and Paper Source. I love how everything turned out! Oh, and it appears a certain princess was also "beary" excited about Paper Source's wrap! Pink packages and green reindeer from Rifle Paper Co.
Captain Sam's spit is a narrow inlet on the south end of Kiawah Island just a few minutes from my house. A battle over the sandy spot has been raging for years. Kiawah Island developers wanted to build a seawall, dock, and 50 luxury houses on the unstable land. Conservators and nature-lovers worried about the destruction such a project would cause. Area dolphins practice a rare strand feeding along the banks. They drive fish up to the shore, then jump up and eat them. The seawall would cover the bank, leaving the dolphins with nowhere to feed. In addition, the spit is home to countless sea birds. Yesterday, the State Supreme Court reversed an earlier decision and has denied Kiawah Development Partners permits to build the seawall! Hooray for the dolphins! Celebrity hairstylist Sarah Potempa offers some rather innovative styling tools. I own the Beachwaver and bought my mom the Jet-Setter for Mother's Day. The Beachwaver is a professional-grade curling iron. You just select L or R (depending on which side you're curling), place the end of your hair in the clip, and hit Go. The iron rotates your hair onto the wand to create even, fast curls. The Jet-Setter is a portable, rechargeable flat iron. You can even get a car charger for convenient on-the-go touch ups. Best of all, Sarah is a fellow Libertyville native. She and my brother were friends throughout junior high and HS. I think of her as a hometown 'hair' -o. Ha. I love the Wonder Years! It is such a great show with the best soundtrack. Kevin's mom, Norma Arnold, has an amazing collection of sweaters. One of my favorites is the one pictured below. If someone could find the pattern, buy yarn in the same palette, and knit it for me, I'd be eternally grateful! Have an awesome weekend! See ya next Friday! As a nun, my great-aunt, Sister Angela, did not have a lot of money. She did, however, have many family members--ten siblings and countless nieces and nephews. When it came time to give Christmas presents, Sister Angela was creative and resourceful. One of my favorite gifts was a set of placemats that she made for my grandparents decades ago. Recycling greeting cards that she had received, my aunt cut the imagery into circles, layered them, laminated the front and added decorative contact paper on the back. I love the vintage illustrations! Every year when I get the placemats out of the holiday box, I find joy in her thoughtfulness. I think they truly embody the Christmas spirit! I don't drink coffee, but I drink tea like a Brit. I prefer my cold tea to be sweet and my hot tea to be herbal. Aveda's organic blend combines licorice and peppermint. It's caffeine free, so it's the perfect beverage to sip on a cold winter's night. You can take the girl out of Chicago, but you can't take Chicago out of the girl. Portillo's used to be a staple of my diet before I moved to the Lowcountry...I'm talking several times a week. Thankfully, on portillos.com, I can have an Italian beef kit delivered to my southern home. In fact, I have a shipment arriving today! Yes, that was my stomach grumbling. And, if I'm ever feeling extra homesick, I can order beef and a Lou Malnati's deep dish at tastesofchicago.com. Thanks to Parks and Rec, I'm a big fan of miniature horses. (You're 5000 candles in the wind, Li'l Sebastian!) My dream is to own an 18th century house with a big barn, lots of acreage, and a couple of therapy miniature horses. This little fella, Black Beauty, is currently for sale. He's therapy trained and is already putting smiles on the faces of rehab patients. The woman at 4:25 of this video keeps my dream alive. Someday...someday..
You know what I'm doing tonight...eating beef and browsing videos of mini horses! Hope you have an awesome weekend! I've been a longtime admirer of my friend Misha's blog series, Friday I'm in Love. Every Friday, she and her gals post lists of ideas, events, and items that they're loving that week. I think it's a great way to learn about new things and gain some inspiration. That's why I am excited to announce that I am joining the circle of fun! Come back every Friday to see what I'm loving. Be sure to check out what Misha, Kendra, Mary Beth, and Amanda are digging each week, too. Each set of 10 is hand-dyed in the same bath to create a coordinated collection. They even have a project guide to make a Quillow (a quilt that folds into a pillow). What is arm knitting? It's when you use your arms and hands, rather than needles, to knit. Using super bulky (6) yarn, you can create fast, chunky scarves and blankets. Even if you're a novice, the tutorials on SimplyMaggie.com are easy to follow. I made the infinity scarf below a few weeks ago during TGIT commercial breaks. And, while listening to the Bears game on Sunday, I knitted the blanket. These prints are a whimsical way to pay homage to your favorite author. I ordered one for a friend and was impressed by the quality. I like the idea of framing the portrait alongside a quote from one of the writer's works. I'm especially partial to Henry David Thoreau (surprise, surprise), Flannery O'Connor, and F. Scott Fitzgerald. I'm hoping that one day, Terrific Friends will immortalize my favorite playwright, Tennessee Williams. Since it's officially the Christmas season, holiday film viewing may now commence. (Confession: I watch Christmas movies all yearlong...and listen to festive music in the middle of summer. I love me some Dean Martin...what can I say?) I especially enjoy the old black and whites. A few years ago, I was pleased to discover one that I had never seen called Holiday Affair. It's a Christmas romantic comedy involving a love triangle between Connie Ennis, a war widow and single mother; Carl Davis, her boyfriend; and Steve Mason, a store clerk. Connie's son, Timmy, is one of the most adorable children ever cast in a film. This lighthearted movie is sure to put you in the Christmas spirit. It includes two of my favorite film quotes: "Anything can change a life that's ready to be changed" and "No time is wasted that makes two people friends." Hopefully you can catch it on TCM or rent it from iTunes.